Light in texture, but heavy on flavour, the multiple layers of lemon curd ensure that this cake is extra-moist and citrussy. It’s perfect as an afternoon treat, or top with candles to make a gorgeous birthday cake. 1. Grease and line the bases of 2 x 20cm cake tins. Preheat the oven to 180ºC, gas mark 4. 2. Place the flour, baking powder, Stork, sugar, eggs and lemon juice and zest in a large bowl, and whisk for 2-3 minutes until smooth and creamy. 3. Divide the mixture equally between the tins, and bake for 20-25 minutes until golden and just firm. Leave to cool in the tins for a few minutes, then turn out and allow to cool completely. 4. Meanwhile, in a bowl beat together the soft cheese, icing sugar and milk until soft enough to spread. Gently ripple this mixture through the lemon curd. 5. Using a breadknife, cut the cake in half horizontally to give 4 layers. 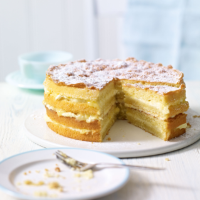 Use the lemon curd mixture to sandwich the cakes together into a tall stack. Dust lightly with icing sugar to serve. This recipe calls for a steaming hot, refreshing lift.Click here to browse our tea and coffee assortment. (opens in a new window).